CHICAGO – Major League Baseball, NBA and the NHL have all brought their All-Star Games to Chicago before. Even the NFL held their version of the exhibition – the Super Bowl champions vs College All-Stars – a number of years in the Windy City. But a first occurred on Wednesday night – a Major League Soccer mid-season classic on the lakefront. The best stars of the top American professional soccer league faced off with an international power – Real Madrid. Fans embraced the exhibition, selling out the contest and packing 61, 428 fans into the Soldier Field stands for one of the largest crowds ever to witness soccer in Chicago. 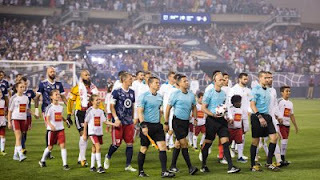 They didn’t exactly see a classic on the pitch Wednesday night, but they did see the MLS All-Stars – lead by Chicago Fire head coach Veljko Paunovic – rally to tie the contest late before falling 4-2 to Real Madrid in a shootout. Hometown fans got to see four of their own on the field as Fire players Bastian Schweinsteiger, Nemanja Nikolic, Johan Kappelhof and Dax McCarty all suited up for the MLS stars. The latter had the biggest contribution of the game in the 87th minute when he started the tying sequence. Off the corner kick, McCarty headed the ball towards the goal but bounced it off the left post. But the ball was hit hard enough that it remained in the crease and Dom Dwyer bumped it in to tie the game at one and force the shootout. There is was Real Madrid that dominated, scoring on all four of their kicks while the MLS All-Stars converted on just two as they fell for the second-straight year to an international club in the contest. For fans of the Chicago Fire, a critical stretch of the season begins in what has been a surprise season. Paunovic’s team is currently second in the entire MLS with 38 points – five behind Toronto FC for the conference and league lead. The second half of the season kicks off Saturday at Toyota Park against New England at 7:30 PM. 0 Response to "The primary MLS All-Star Game held in Chicago closes in a shootout loss to Real Madrid"